Is it possible to be alone in the second most populous country on earth? In the orange sun of a late Indian afternoon, a twelve-car train lumbered toward Pallam Station on the muddy outskirts of southern Delhi. In anticipation of the locomotive’s approach, the platform, already thick with people, turned into a frenetic hive. I tightened the straps on my pack, scanned for my assigned carriage, and prepared to make the leap aboard the Jaisalmer Express. I was headed for the mythic city from which the train took its name. Located in the Thar Desert near the border with Pakistan, Jaisalmer was, in the days of the maharajas, an isolated little trading post, a Silk Road version of the Last Chance Saloon. The Thar, which blankets the entirety of western Rajasthan with 77,000 square miles of stone and sand, is the dead edge of India. Friends had told me it was one of the few places where it was still possible to find solitude. During my writing-related wanderings across the Indian subcontinent, I had never once been alone. After months of squeezing through impenetrable crowds in the second most populous country on earth, solitude had never sounded more attractive. In the meantime, though, the train was packed. Passengers poked out of the doors and windows of every soot-splashed car. That night, as starlit Rajasthan slipped beneath our wheels, I leaned out the door nearest my berth and inhaled deep droughts of the fresh, dry wind that raged over the plains. The bejeweled sky shimmered clear and bright. I was enjoying the moment, immensely, until a large bug flew into my ear and I was forced to retreat back indoors. I sat on my bunk, digging at the insect’s corpse, while the five mustachioed Rajasthanis in my compartment prepared for bed then fell instantly asleep. I was less successful. The foam-padded mattress measured five feet, eight inches in length, which was exactly six inches too short to accommodate my corn-fed American frame. So I lay down, folded into angles, and listened to the regular percussion of wheel on steel, the occasional high-pitched whistle tearing at the darkness, and the fitful snoring of my slumbering neighbor below, who lurched and moaned, but never took his suspicious hand off the leather bag tucked beneath his low bunk. The bustle of Jodhpur snatched me from fitful dreams just as the first shafts of morning light lit the tops of the Siwana Hills. Jodhpur is a pulsing, energetic city, the second largest in Rajasthan, and many people were disembarking here, including three of my compartment-mates. Rousing myself slowly, I peered out through cracked glass and felt pangs of disappointment. Still crowded. The train rolled on. As the fringes of Jodhpur faded from view, I could see that we were entering the Thar, also called the Great Indian Desert. The land was hard and rocky. The prolific stands of wispy, thorn-covered kejri trees were becoming sparser as we rumbled west, where straggly bands of roving camels were quickly replacing oxen as the livestock of choice. Massive Blue Bull antelope, with their bizarre deer’s heads and horse’s bodies, wandered hurdy-gurdy across the tracks, undeterred by our lumbering advance. Sand dunes began to periodically rear their heads above the scrub and blow through the door of the train, and, though habitation was becoming more sporadic, rustic, mud-walled villages continued to dot the horizon. We dieseled away from the rising sun. I sat captivated by the rapidly evolving landscape. A gauzy haze polluted the sky, so that my first views of Jaisalmer a few hours later were weak and surreal. Literally born and built of dust and sand, Jaisalmer has a wild, frontier feel pervading its maze of alleys. A massive fort, which towers more than 250 feet above the crumbling streets below, dominates the town. Jaisalmer drips with royal history and Silk Road intrigue. From its founding in the 12th century, it was a critical link on the caravan trail linking the Far East with the Persian Empire and eventually, Europe. Generations of kings and merchants grew fat and wealthy here on trade, and carved for themselves a princely oasis from the sandstone desert. 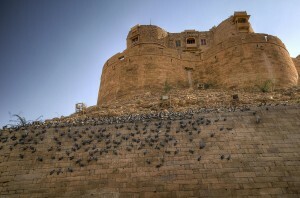 Jaisalmer has ever owed its prosperity, and even existence, to travelers. For 800 years, foreigners have wandered the lanes of this outpost, searching for treasure. Now, however, the treasures tend to be of the Pier 1 variety, exotic knick-knacks and kitschy keepsakes. Countless stalls overflow with camel leather bags, woven baskets, and ornate metalwork. Similarly, the travelers choking the cobbled streets are no longer turbaned traders from the orient. They are Spanish tourists, Korean students, and Bohemian backpackers who drift through the fort, guidebook in hand, chugging water, sweating through their tank tops. Despite the kitsch and the multitude of Italian restaurants, Jaisalmer retains a great deal of charm. The Silk Road is long gone, but situated just 47 miles from the volatile Pakistani border, this town still feels a little dangerous and unpredictable. On the corners, the beautiful old houses, called havelis, boast intricate sandstone carvings and latticework. Jaisalmer is better outfitted for tourists than many places in India; there are many hotel options and a variety of excellent places to eat. In the city’s back alleys, you can sample traditional snacks like boondi (a fried sweet made from chickpeas) or rabri (a soup consisting of fermented yoghurt, flour, and onions) from a multitude of small cafes. In the evening, a long meal at Trio’s rooftop restaurant, overlooking the Mandir Palace and the old fort is an essential way to soak up the golden-hued atmosphere. Jaisalmer’s decrepit charm notwithstanding, this little kingdom on the edge of the world did little to satisfy the yearnings that had first drawn me into the desert. With 65,000 inhabitants, Jaisalmer might be a small town by Indian standards, yet it is no bastion of seclusion. From the roof of my friendly little hotel, the Shahi Palace, I could see that porters, sweepers, tourists, and hawkers occupied every narrow lane. I wanted to go deeper, to truly touch the frontier. There was no shortage of salesmen happy to offer the escape for which I was searching. Guides on corners peddled camel safaris to this dune or that dune. They were cutthroat. They were wild-eyed. They vowed to tailor trips however you pleased. But I demurred. Camel safaris had become obligatory in Jaisalmer. I had heard from many other travelers that some of the larger dune fields were packed with camera-wielding tourists, bent on immortalizing the illusion of solitude. It turned out that Amman had grown up in a parched little village out there in the sand, driving a line of camels from one watering hole to the next. But opportunity and money were sparse and he eventually headed for Jaisalmer, the only real town for 200 miles. He had been driving tourists out to those same watering holes ever since. The next afternoon, we pinballed through Jaisalmer’s bloated streets in Amman’s beat-up jeep and headed west. I was stunned at the suddenness of our relative isolation. After passing a couple of hotels and an army base (the “Thundering 22nd Battalion”), we found ourselves in the middle of a void. The road was good, smooth blacktop, kept in pristine condition as the primary artery for troop movements to and from the approaching border. Giant windmills turned laboriously in the distance, generating power for the massive floodlights perched along the wire fence that ran the length of the Pakistani frontier. Otherwise, all was quiet and empty. My excitement grew as we neared the absence of civilization. We drove farther and farther, past sprinting herds of chinkara antelope, which followed in our dusty wake like dolphins before veering off to melt into the horizon. The shocking vastness of the scene playing out before me was hard to register. This was a harsh, angry land. 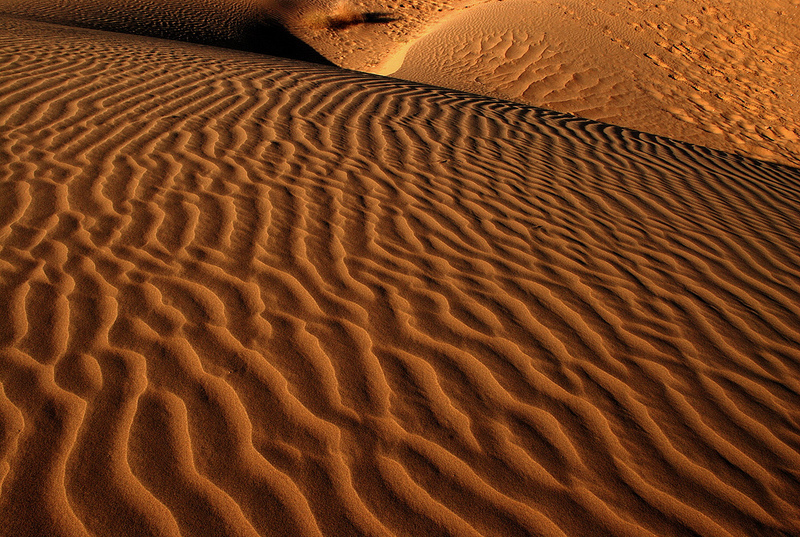 Strings of camels wandered sporadically through the sand and scrub, their forms shimmering and dancing in the wavy heat of late afternoon. Many had succumbed to the desert; their carcasses lay by the road becoming leather in the sun. But even out here there were efforts at habitation. A few desperate villages, some abandoned, squatted in clumps on the horizon, where a smattering of forlorn goats milled about for parched vegetation. These little shepherd settlements amazed me, and I stared in awe at human kind, which had the audacity — or was it only the stubbornness? — to birth life in a place where it so clearly doesn’t belong. There it was, the most improbable snack stand in the world. A small, mud-walled hut in the middle of nowhere, attended to by a bored-looking youth with a small selection of potato chips, bags of nuts, and single serving shampoo packets. I couldn’t fathom who might stop there. Virtually no one was around. We turned off of the good road and onto cracked asphalt. The dunes here were unchecked, and many were drifting lazily over the thruway. Our path eventually became a two-wheel track. Amman had to gun the engine hard to get through patches of sliding sand. We had arrived at the end of the road. No more people, no more paths, just a thousand shades of beige fading into the nothingness of early evening. We stopped and got out near a large stretch of rolling, wind-blown dunes to watch the last light of day sail off to the west. Amman said this was as far as he was willing to go. We were only six miles from the line of control, where nervous soldiers sat with loaded guns. To go that far, he said, would be trouble. So I climbed to the top of one of the tallest dunes, shoes sinking six inches with each step, to gain a better view. Amman waited in the jeep, drinking Kingfisher beer, strengthening himself for the long dark drive back to Jaisalmer. I couldn’t believe it, I was in India and I was utterly alone. One billion two hundred fifty thousand people in this country and not a single one of them in sight. A solitary eagle and a handful of chinkara, bounding off toward Pakistan, were the only signs of life. Despite the greatest efforts of insatiable men, there were still places where people simply could not scratch out an existence, even in India. I had finally found the nothing for which I had searched, but something wasn’t right. Surprisingly, I did not feel the sense of relief that I had expected. I felt small. I felt uneasy. A disquieting silence throbbed in my ears. I had grown accustomed to the constant hum of the populated world. Devoid of it, I felt antsy and monophobic. After a hushed half hour, I had had my fill. Chris Watts is a regular contributor to EthnoTraveler.